Kalaupapa Rare Adventure, LLC dba Kalaupapa Guided Mule Tour, operates on the Hawaiian island of Molokai, is a Hawaii-based business previously known as Molokai Mule Ride Inc. (MMR Inc), incorporated on July 3, 1993. We remain a small, closely held, two family company working to bring happiness and joy to riding patrons. 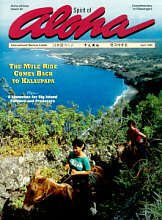 The Molokai Mule Ride has been featured in travel magazines and brochures as well as various video publications, making the Molokai Mule Ride one of the world’s most famous tours. 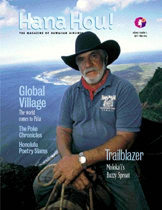 Another cover story in the Hawaiian Airlines Hana Hou Magazine features one of the owners, Buzzy Sproat. Worth reading!